KUALA LUMPUR, May 25 ― Former Indonesian vice-president Jusuf Kalla has accused Datuk Seri Anwar Ibrahim of reneging on a peace deal to respect the outcome of Election 2013 that he brokered between the opposition leader and Datuk Seri Najib Razak in April. The renowned international newspaper said that Anwar admitted to making the pact but told the WSJ that his opponents had nullified the deal by the way they ran their campaign. “How can you talk reconciliation when you demonise your opponent in this manner?” Anwar was quoted as saying. The WSJ wrote that it was Anwar who had approached Jusuf on the agreement two months ago, seeking the latter’s help in securing his opponent’s commitment for a peaceful election outcome. The deal — that both sides refrain from personal attacks during campaigns and to accept the outcome of the polls — was subsequently made in April. The two rivals had apparently rejected a clause in the accord to offer the loser a role in a “reconciliation government”, the WSJ wrote. An adviser to Najib reportedly confirmed the deal, telling the WSJ that Anwar had sought Jusuf’s assistance to secure a mutual agreement to accept the results of the polls peacefully, regardless which way it goes and even in the event of a slim majority. “The prime minister reiterated privately to Jusuf Kalla and in public before the election that BN would respect the will of the people and accept the election results, even if the opposition wins,” the paper quoted the aide as saying. But Anwar’s version of the events surrounding the peace deal appeared to differ. Quoting Anwar, the WSJ wrote that it was Jusuf who reached out to offer his assistance in ensuring an orderly outcome to the polls. “There were many friends around the region who were concerned about the transition of power and whether it would be peaceful,” Anwar reportedly said. 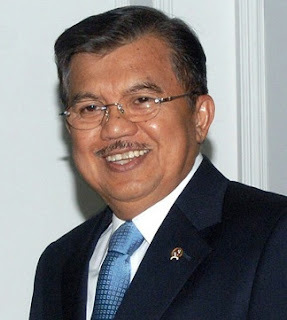 According to the paper, Jusuf is known for his role in brokering peace deals during his term as vice-president from 2004 to 2009, having done so in Thailand and Sri Lanka to help resolve conflicts across the Indonesian archipelago. In the May 5 polls, Najib and the ruling Barisan Nasional (BN) was returned to power in Putrajaya after a heated contest that saw Anwar’s Pakatan Rakyat (PR) win the popular vote but lose the polls. A dissatisfied Anwar and PR have been staging mammoth rallies across the country since the close of the election, insisting that the election had been stolen from them through fraud and widespread cheating. During one of his rally speeches, Anwar vowed never to surrender until PR claims its rightful place at the helm of Putrajaya. The 65-year-old Anwar also appears to have put his plans for retirement on hold, and seems determined to fight on. PR’s point of contention was the popular vote, which saw BN scoring just under 48 per cent of the total number of votes cast and PR scoring the majority at 51 per cent. But the uneven dispersal of votes across various constituencies, which PR has labelled gerrymandering by the BN, had cost them the election as it only snapped up 89 seats to BN’s 133 seats in the 222-seat Parliament despite winning the popular vote. Apart from the “Black 505” rallies, which have drawn mammoth turnouts all around, PR is also filing formal petitions against the results in 27 constituencies. 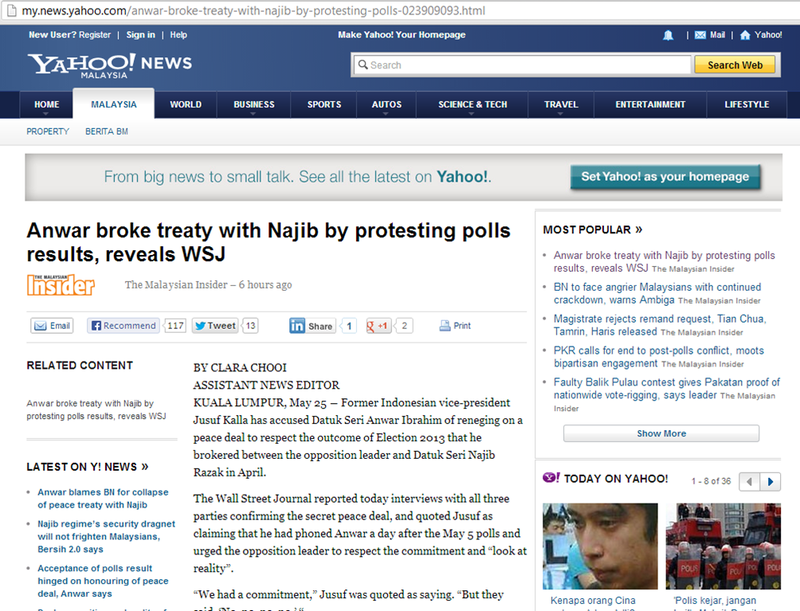 But the WSJ noted that Anwar believed these challenges were unlikely to turn the polls back in favour of his PR. It added that although Anwar had accused the Najib camp of undermining his campaign with personal attacks, Jusuf did not join the opposition leader in the criticism. Instead, the Indonesian leader said he felt both sides had met their commitment to refrain from personal attacks during the campaign. But Jusuf said he fears that a prolonged dispute over the polls results between Anwar and Najib’s camp would only harden existing divisions among factions in Muslim groups and the Chinese and possibly lead to violence.